It is the title of the exhibition open in the ÚĽUV Gallery in Bratislava until 28 September 2012 and presenting glass paintings of Zuzana Vaňousová. A book named after the author has been published. Zuzana Vaňousová, maiden name Kronerová (born in 1922, Staškov) is the oldest painter of glass paintings in Slovakia. She is a sister of unforgettable actor Jozef Kroner and one of twelve siblings. Her father was an actor and director in an amateur theatre and several of his children inherited his acting talent. Zuzana Kronerová was a successful actor in amateur stage plays in Považská Bystrica. She has also been a gifted painter but she has focused on painting after she retired. She attended a painting course under the guidance of academic painters. She learnt tempera, watercolour and oil painting techniques and then redirected her attention to glass painting. 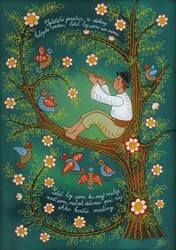 She paints landscapes and portraits in oil and tempera or she paints folk tradition inspired pictures. She depicts folk songs and integrates texts of the songs into glass paintings. Zuzana Vaňousová selected several folk tradition decorative elements for her glass paintings. Her work is very specific in content and visual expression. She often paints wedding ceremonies, tinkers, horses, working activities such as cabbage pressing and viniculture, dancing couples, robbers, winter nativity scenes and other religious topics. She authorises her pictures with „ZV“or with „ZEV“ majuscules meaning Zuzana Eva Vaňousová – which means that she has painted such pictures in collaboration with her daughter Eva.